As residents of New Jersey, we are all too familiar with Lyme disease. But what really is Lyme disease, what causes it, how does it affect our pets, and what can we do to treat and prevent it? Lyme disease is caused by a bacterium (Borrelia burgdorferi) that is spread by the deer tick (Ixodes scapularis). 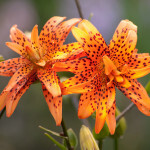 The tick initially ingests the bacterium when feeding on wildlife or other dogs that are infected, and then spreads it to other animals when it bites to take its next blood meal. Dogs that are exposed to Lyme disease exhibit a variety of clinical signs ranging from none at all to death. 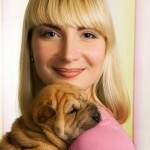 Many dogs that test positive never develop clinical signs of the disease. When dogs do show signs of the disease, they are most commonly either signs of general malaise (fever, lethargy, depression) or lameness. Less commonly, Lyme disease can affect the kidneys and cause irreversible kidney failure and death. 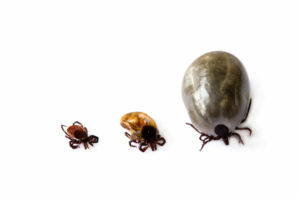 Lyme disease is diagnosed via an in-house test called a “4DX.” It got its name because it diagnoses four diseases: heartworm, Lyme disease, Anaplasmosis, and Ehrlichiosis. 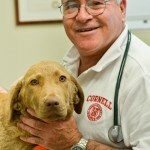 With the exception of heartworm, we see these diseases all the time in Hunterdon County and the surrounding area. After diagnosis, a urine sample may be examined to look for kidney involvement. The treatment is generally a month long course of antibiotics. After treatment and at the time of future 4DX tests, a more specialized test called a “quantitative C6 antibody” test is sent out to the diagnostic lab. This test quantifies a specific antibody that is only made during active infection and allows us to decide whether further treatment is required. In some cases, it is impossible to completely clear the organism from the body. For this reason, even with appropriate treatment, signs of the disease can flare up again in the future. So how can we protect our canine companions from ticks and their diseases? There are two main strategies that we can employ: tick preventatives, and vaccination. Tick preventatives come in multiple formulations, and generally have the added benefit of killing not only ticks but fleas too. The products that we at Flemington Veterinary Hospital generally recommend are Frontline, Advantix (both topical), Nexgard (oral), and Seresto (collar). The Lyme bacteria has “outer surface proteins” that change between the tick and the dog. These proteins (Osp for short) are what our vaccines help provide coverage against. OspA is found in the tick, and there is only one type. 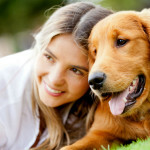 OspC is found in the dog, and there are 11 different types that have been observed. Older vaccines protected against OspA and one variety of OspC, but our current vaccine provides broad spectrum coverage against OspA and seven types of OspC. There is not currently a vaccine that can protect against all OspC antigens, which is why vaccinating against Lyme disease isn’t 100% effective. However, it does dramatically reduce the chances of infection and can minimize the seriousness of the disease in a majority of vaccinated dogs. In addition to the above, you can also help prevent Lyme disease by making small changes in your behavior. Avoiding wooded areas with excessive leaf litter or fields with tall grass will decrease tick exposure. Checking your dog closely for ticks after exposure to these areas is a great way to find ticks before they have a chance to bite. Keeping your lawn, bushes, and trees trimmed and raking dead leaves will allow for more sun exposure and make your property less appealing to the ticks.